If you've got one of the many fantastic GoPros that are among the best action camera options on the market, you may not be aware of the huge world of accessories that's now open to you. 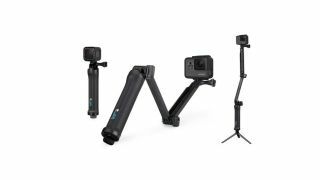 Tripods, harnesses, memory cards, grips, protectors and more – there's a huge range of accessories designed for all sorts of different purposes, all of which can augment your GoPro shooting in different ways – especially with GoPros proving one of the best travel camera choices. But which are the best to buy? We've put together this guide to help you figure this out, featuring the very best GoPro accessories. If GoPros float your boat, you might also be interested in our guide to the best underwater cameras, as well as the best dash cams on the market right now. Speaking of waterproof camera models, while GoPro has started adding native waterproofing to its more recent Hero cameras, the deepest they’ll go is 10m. If you plan on diving and shooting deeper than that, you’ll want to get hold of a waterproof housing, and currently your best bet is GoPro’s own Super Suit. Its included Waterproof Backdoors allow for diving down to up to 60m (196ft), and it has a flat glass lens to deliver maximum sharpness. The case also serves as protection against dust and flying debris. The Waterproof Doors can be swapped out for Skeleton Doors to allow for use of the touchscreen, though this will make the case no longer waterproof. SanDisk’s reputation for high-quality SD cards is well-deserved. The Extreme series pair lightning fast read/write speeds with a hardy build that’s waterproof, temperature-proof, shock-proof and X-ray proof. Among the best memory card options on the market, these are 4K-ready, with UHS Speed Class 3 (U3) and Video Speed Class 30 (V30) ratings, so you can be confident in capturing even the highest quality of footage. Casey is a simple, straightforward semi-hard case designed to keep your GoPro and all its ancillary accessories safe in one place. It’s got a customisable interior with adjustable dividers, so you can make the space your own, and there’s also a removable pouch insert that’s great for small bits like SD cards. The hard shell protects against shocks, while the weather-resistant design adds a layer of protection for inclement weather. It was an extremely welcome move when GoPro started introducing touchscreens into its Hero cameras, but screens of course do need to be looked after, and this is doubly true for action cameras that are thrown into tough situations. GoPro’s screen protector set is a simple, inexpensive solution, not only safeguarding your screens from scratches and smudges but also reducing glare on sunny days, making the screen easier to see and use. Spare batteries are a must for any serious shooter – you don’t want to take your GoPro out for a day only to discover you forgot to charge it the previous night and are now toting a stylish but functionless brick to the beach. The Dual Battery Charger from GoPro allows you to charge two batteries at the same time, and comes with a spare in the box, meaning it’s easy to make sure you’re gassed up and ready to go. If you're using a GoPro regularly, you're likely to find yourself outdoors a lot more often, and it's worth making sure that your entire accessory setup reflects that. This power pack is not only a great way to provide your GoPro with a little extra juice in a pinch, but it's also thoroughly weatherproofed and will be able to cope in even the most inclement of weather conditions. A handy extra feature is the built-in LED flashlight, which could prove very useful in an unexpected emergency. There are so many camera backpacks to choose from, but this bag from Manfrotto is specifically designed for users of GoPros and other action cameras. While it’s small enough to take as carry-on luggage, it can hold up to three action cameras with accessories, and even comes with its own GoPro mount on one of its straps, making it great for recording your travels. There’s also space for a tablet and a holder for a tripod, making it one of the best camera bags for the adventurous photographer. If you’re planning to take your GoPro biking, hiking or on a similar adventure, you’d do well to get yourself the hands-free Chesty mount, allowing you to fully immerse your viewers in the action. Made from lightweight, breathable fabric, the Chesty also sports a quick-release buckle that allows it to be slipped on and off very easily. Its adjustable straps ensure it fits over the vast majority of body types, and even heavy jackets if you’re taking it into the cold. Sometimes, you want that perfect first-person perspective. The Head Strap + QuickClip is a useful double package that includes both a fully adjustable head strap and a clip designed for quick attachment to caps, belts and similar items of apparel. It’s a useful pairing, especially for the price. GoPro offers a few helmet mounts for different types of protective headwear, but the Front + Side Mount is the most versatile. As the name implied, you can stick it on the front or side of your headgear depending on what suits you best, and it comes with an included Swivel Mount assembly that makes it easy to adjust the angle. The impressive 3-Way is an amazingly versatile piece of kit – you can fully extend it to 20in to use it as an extension arm or selfie stick, or collapse it down to 7.5in and use it as a secure camera grip, or erect it as a tripod to provide static camera support. It isn’t quite as stable as a dedicated tripod, so if you’re likely to be in high winds or on particularly tricky surfaces you’ll want to look elsewhere. For the light traveller, however, this is a fantastic space-saving accessory. Though GoPro’s Karma may not have flown quite as high as very best drones, the Karma Grip gimbal that formed part of it is still a useful addition to any GoPro setup. It creates smooth footage with a 3-axis stabilisation system that works well even in extreme situations, and the integrated buttons on the grip make it easy to control your camera. It’s worth noting that a lot of the technology in the Karma Grip made it into the new Hero 7 Black, so while it’s compatible with that camera, you very likely don’t need to shell out for it if you’re springing for the latest model. With the Jaws Flex Clamp, you can securely attach your GoPro camera to objects ranging in size from 0.25 to 2in (0.6 to 5cm) in diameter. The malleable neck allows you to position the camera exactly as you want to best capture what you want it to see, though if you want a lower shooting profile then you can remove the neck and attach the camera directly to the clamp itself. The Jaws are designed to grip irregular shapes and even extremely thin objects of less than a centimetre, meaning you can be sure of a secure on practically anything. With its many-jointed legs and grippy, rubberised feet, the Gorillapod from Joby has long been a favourite among photographers looking for a versatile camera support. Wrap it around a tree branch, hook it to a car door, or just rest it on a rough surface, and you’ll have yourself a reliable base. Its sheer versatility makes the Gorillapod the best tripod for many run-and-gun shooter, and the Action Tripod is specially optimized for GoPro cameras – its compact form factor makes it a great addition to a GoPro-focused kit bag. If all you need is a straight support, Manfrotto’s PIXI Evo 2 will more than fit the bill. This mini tripod even manages to pack in two leg angles, meaning you’ve get extra support on uneven ground, and its aluminium build combines portability with strength. In the GoPro family, the 360° Fusion sticks out a little (hence why it doesn’t bear the ‘Hero’ moniker). The reason some of the products on this list specify compatibility with ‘all Hero cameras’ and not the Fusion is because it has noticeably different dimensions to the rest (not to mention lenses on both sides). The Fusion Grip works similarly to the 3-Way – able to function as a grip, tripod and extension pole, with magnetic legs that can lock onto a range of different surfaces – only it’s specifically made for the Fusion. The classic suction cup. Mount your GoPro onto a car, boat, dirt bike – anything with enough flat surface to make the attachment. The cup’s grip has been tested at speeds of more than 150mph, so feel free to open up that throttle and let rip, safe in the knowledge your adventures will be captured. Useful for bike handlebars, ski poles and other similar applications, this secure mount uses a hinged, non-slip design to clamp on securely. Its 360° base allows for easy changes of angle, and if you’re using it in combination with other mounts like a helmet mount, the mounting buckle allows you to quickly swap the camera on and off. The Fetch can be mounted on your dog’s back or chest, providing two different perspectives. It’s comfortable, breathable and also machine-washable, which is useful if (/when) your dog decides to roll in something unpleasant with the camera attached. It’s adjustable to fit dogs weighing 15 to 120 lbs, though if you’ve got an extra-tiny puppy, you can reduce the size by removing the chest mount. Though GoPro on-board sound recording is getting better and better, if you want maximum quality you’re going to want to spring for a dedicated microphone. One of the most cost-effective is the RØDE VideoMic GO, an eminently capable, high-quality directional video microphone that will dramatically improve the audio you’re capturing. Be aware that some older models won’t have the appropriate jack so you may need an adapter. If you need extra illumination for your shoots then the Lume Cube is a great choice as it’s built from a tough metal shell and waterproof down to 30m, meaning it can take the same kind of punishment as your GoPro camera. It puts out a generous amount of light, especially at short distances, and while its size means it only has one control button (which allows you to power it up and cycle through brightness settings), it also offers Bluetooth control via mobile. If you’re taking your GoPro into water, and you lose your grip on it, you very possibly won’t ever see it again. Many users have found out the hard way that these little cameras do not float, at all, and if this is something that worries you then it’s worth picking up the MagiDeal floating handgrip, which not only keeps your GoPro camera buoyant but also provides an easy way to aim your shots and capture stable footage, even while engaging in watersports like windsurfing or wakeboarding. Extending to an impressive 38in and collapsing to just 15in, El Grande is a great choice to take on your travels for capturing unique perspectives and getting selfies. It’s got an integrated ball and socket design at the end of the pole for easy camera swivelling, there’s an oversized grip for secure purchase, and what’s more, it’s waterproof. While many GoPro cameras are controllable with your phone, many phones aren’t equipped for the kinds of challenges you might put your GoPro through. That’s where the waterproof (10m) Smart Remote comes in. It’s wearable, waterproof and can control up to 50 GoPro cameras at the same time from up to 180m away. Its built-in LCD can also mirror the camera’s screen for quick confirmation of status and settings.